Gordon Chisholm has signed Scott Fox on a two-year deal after the goalkeeper was released by the Dundee manager's former club, Queen of the South. Manager Chisholm had taken the 23-year-old to Dumfries in January, handing him an amateur contract. 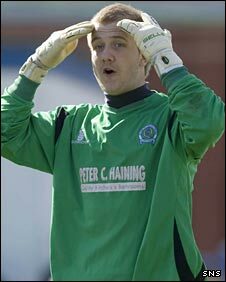 Now he will compete with former Scotland and Celtic goalkeeper Rab Douglas to be Dundee's number one. Fox said: "I trained with Rab at Celtic when I was 16 and I know how good a keeper he is." He is hoping that the 38-year-old Douglas will help improve his own game as they attempt to help Dundee win promotion from Division One. "I want to play, but it will be hard because he is one of the best keepers in the league," said Fox. "As well as competing with him, I think I can learn a lot because you are talking about a guy who has played in huge games for Scotland and Celtic." Fox began his career at Celtic Park and had a loan spell with East Fife before his release from the Scottish Premier League club. He made six appearances for Queens in Division One last season before signing a pre-contract agreement to be re-united with Chisholm, who had left Palmerston for Dens Park in March. Fox will fill the space in the squad left by the departure of Derek Soutar, who joined Cypriot club APEP Pitsilia this summer.